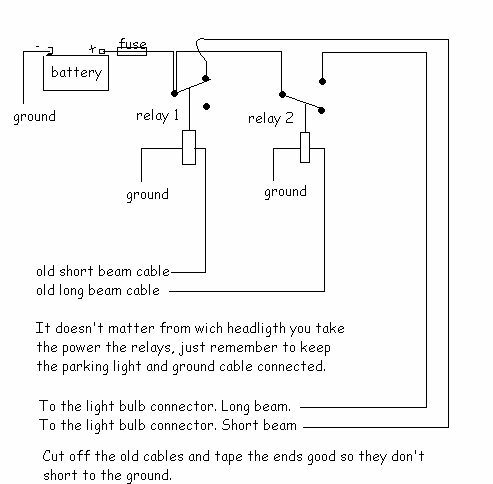 All this talk about Sealed Beams, H4 and their predecessor that we Europeans call "plain old headlight bulb" makes me remind you all about VOLTAGE. When I upgraded my 1971 Kombi to H4's I happened to measure the voltage at the bulb's socket. It was just under 10 Volts. If you look at the scheme for your VW you can understand why. The Voltage should be about 13 Volts. The resistance in the bulb about 2.8 Ohms. The current is then 4.2 Amperes. This gives about 55 Watts. The resistance is relatively constant at 2.8 Ohms. 1. They don't have the alignment bumps on them that sealed beams have, thus necessitating manual alignment. 2. They do, over time, get tarnished inside in the silvering. I used mine for 7 or 8 years and could definitely see some degradation inside. This is why they are not DOT legal [in the US] and what DOT is protecting us from by making us use sealed beams. Sealed beams are mediocre, but at least they won't get worse! I'm sure they could be taken apart and resilvered, like the lights on your 1934 Duesenburg J, but it might be cheaper to buy another set for spares in a few years.